Film Courage is a neat online radio show that is run by David Branin and Karen Worden. Their show delves into the stories of filmmakers, directors, actors and more in the film industry with in-depth interviews and stories. After three long years of starts and stops, they are proud to announce FILM COURAGE PRESENTS THE WORLD PREMIERE OF GOODBYE PROMISE. This Los Angeles event with cast/crew Q & A will take place Friday, June 1st, 2012 from 7:00 p.m. to 11:00 p.m. at The Downtown Independent, 251 S. Main St., Los Angeles, CA 90012. Upon moving to Los Angeles, Matt makes a pact with himself: In seven years he’ll be a working actor. He makes a promise that if he isn’t working by then, he’ll pack up and return home. This story begins seven days shy of the seven year deadline… and he is just as anonymous as the day he started. This is his goodbye story. Then 26-year-old producer Richard Jacob served for the United States Armed Forces, risking his life on the front lines in Iraq during part of the production of this film. Parts of Goodbye Promise were filmed blocks away from the 2009 Los Angeles County Station Fire, capturing some of this unsettling footage, as a twenty-person set prepared to evacuate between takes. This film is 100% improv, with no script or camera crew. It was shot without a production budget, yet raised over $16,000 on Kickstarter in 53 days with 227 backers during a 2010 crowdfunding campaign to assist with post-production costs. Please join them for a very special night of moviegoing and post-screening discussion with cast/crew. PS – they are anticipating that the June 1st screening may sell out fast. Advance ticket purchases are recommended. 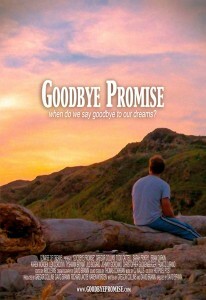 Comments for Film Courage Presents World Premiere of Goodbye Promise are now closed.